From reading our first Corporate Responsibility reports, whilst engaging in social enterprise at university, we felt it was near impossible to compare organisations based on their social, financial and environmental performance. Vertigo Ventures was founded to support companies to understand and transparently report their impact. Part of the inertia in sustainability is caused by a lack of information about performance. Companies need to be able to spot the gaps in their sustainability quickly in order to allocate resources in response – this will allow them to avoid the consequences of poor performance and damage to their reputation. What we set out to do was to help make it easier for companies to determine what the key indicators are to report on and to then share that data through their annual reporting processes. Global companies have the capacity and the scale to impact on social, environmental and economic factors. They can have measurable effects in tackling key challenges such as the Millennium Development Goals, laid out by the United Nations. Vertigo Ventures aims to show clearly the links between a company’s activities and impact in order to encourage more responsible business practice and proactive development of sustainable opportunities. We look to collaborate with organisations to use the information compiled by Vertigo Ventures to embed sustainability performance measurements to support a sustainable future. 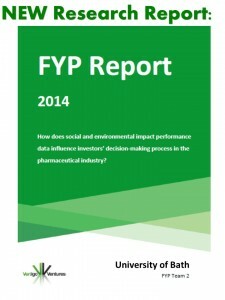 We would like to see a table of relevant impact indicators and performance data to be included in every sustainability report, using a set of core, agreed, sector specific indicators that all organisations transparently report on in a consistent way in line with efforts to improve integrated reporting by 2015.